If you've been wondering where ex-King Diamond guitarist Pete Blakk has been lately (I haven't). The answer is, he's been mostly MIA for ten years. If you want to know what he's done lately, then look no farther than Disaster Peace. The band and self-titled debut features Blakk, another ex-King Diamond cohort, drummer Hal Patino and heavy metal screamer Wade Black (Crimson Glory, Leatherwolf, Seven Witches). The production was overseen by Blakk's long time friend and King Diamond guitarist Andy La Rocque. The result is an album of intense heavy power metal which pummels you into submission from beginning to end. With few exceptions, that last sentence basically describes the content of Disaster Peace's premier. The pace is fast, the mood intense and foreboding, the vocals raw and screaming (with a few death growls thrown in to please modern metal fans, I'm sure), and the guitar solos abundant and blistering. That's pretty much it, and from song to song. There's little or no variation whatsoever. So essentially, after the intro, all you need to do is listen to the second and third songs and you have the full extent of the album. The exceptions are one instrumental segue, 'Purgatorio,' two longer and eerie guitar instrumentals at the end, and the strangely inconsistent to the rest, 'Don't Come Back.' But there's nothing extraordinary about any of these. Additionally, Disaster Peace covers Zep's 'Immigrant Song' in a heavy metal fashion with scary bad results. The real highlight is Blakk's exceptional guitar work throughout. He's still got it. The other real star is the rhythm section who must have had the patience of Job to endure the pace and monotony of the song arrangements. Finally, I tired of Wade Black's vocals early on (and I loved his work with Seven Witches). Excluding the aforementioned blip 'Don't Come Back,' the only distinguishable variation in his vocal presentation came on 'My Guns.' All this really proved is that Black still has leather for lungs and not much more. 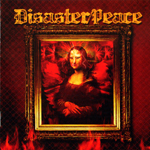 If you're a fan of guitarist Pete Blakk foremost, and then a fan of intense heavy/power/thrash metal with little novelty or variation searing your eardrums shut and reducing your brains to soggy mush, then Disaster Peace is definitely for you. Otherwise, the work is mostly redundant and even less memorable.